You may come across a scenario in which a SKU on a channel doesn't have the exact matching (case-sensitive) SKU value on Zentail. Because SKU values cannot be edited on Zentail, this means that the Zentail SKU and the channel SKU don't automatically sync. Never fear! Zentail has you covered with our Channel SKU Override feature that allows you to sync products on Zentail with corresponding products on a selling channel whose SKU values don't match. What is a SKU override and when is it necessary? A common issue you may face is that before joining Zentail your SKU values on different channels weren't standardized, and therefore you were unable to sync all your products' catalog data, pricing, and inventory together. 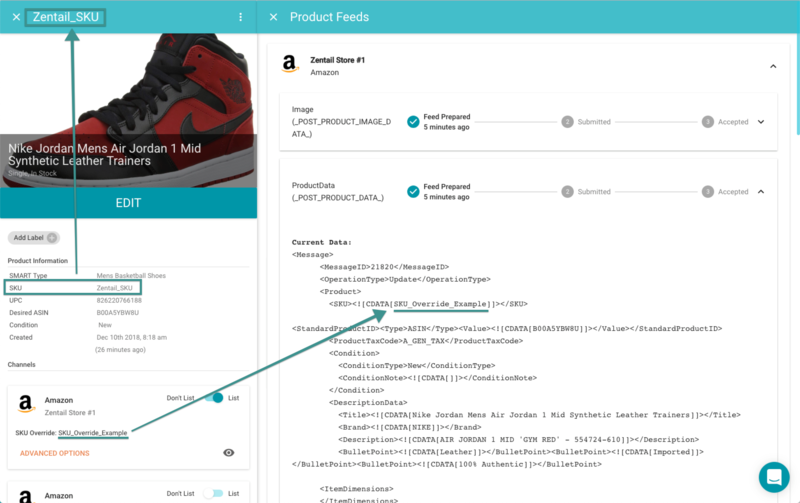 Furthermore, the SKUs on the selling channels are tied to a product history on the channel's listing that includes historical product performance and customer ratings that you don't want to lose when migrating your catalog over to Zentail. Because you can't edit a SKU value on Zentail, you need to find a way to sync a Zentail SKU to the corresponding SKU on a channel. This is where Channel SKU Overrides come into play. Example: In the screenshot below, you'll see an example of a SKU that exists on Zentail as Zentail_SKU but the same product already exists on Amazon as SKU_Override_Example. Notice that through the feeds, Zentail is simply tying to that existing Amazon SKU without having to edit SKU values on either platform. Please note that this cannot be applied on a SKU-edit level but rather through your Quick Edit View or through Import/Export pages. *** FBA SKU Overrides cannot be applied on the user-front end of Zentail. If you would like FBA SKU Overrides to be applied, please consult your onboarding specialist. eBay, Shopify, Magento, and BigCommerce allow the editing of SKU values, therefore editing the SKU values on these channels to match Zentail is generally preferred rather than applying SKU overrides. For Walmart, Zentail also gives you the option to Send SKU Update, which simply updates the SKU value on the channel to match what's on Zentail. This can be enabled under the Walmart Advanced Options view when editing a SKU.